Sri City, January 23, 2018:– International Flavors & Fragrances Inc., a leading innovator of sensory experiences that move the world, has broken ground for a new flavors and fragrances plant in Sri City, in the august presence of Mr. Ravindra Sannareddy, Founder Managing Director, Sri City, Mr. B. Anilkumar Reddy, Joint Director, District Industries Centre, Chittoor and a host of senior executives from IFF. The plant is expected to be commercialised in December 2019. 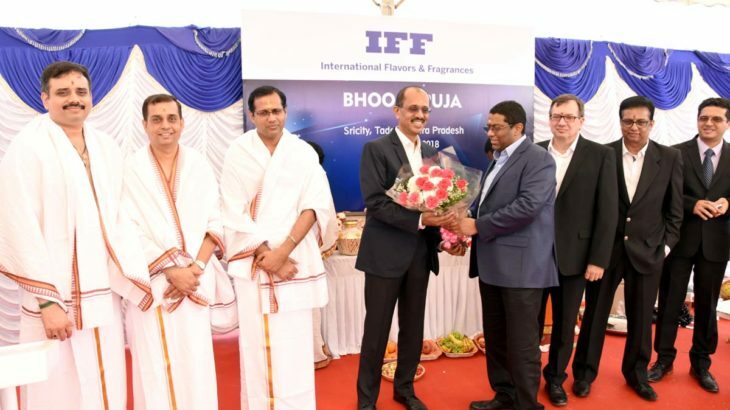 The new facility, which will be the largest flavour and fragrance manufacturing facility in India and the largest IFF site in Greater Asia, occupies a 32-acre/130,000 m2 plot and will serve IFF customers across India and the region. The capacity of the plant will be 36,000 m tons per annum, and investment will be Rs.500 crores. It will provide employment for 450 persons. In line with the Company’s dedication to drive sustainability across the entire organization, the site is designed for efficient water use and reuse, to include rainwater harvesting capabilities, energy efficient building materials and equipment, maximisation of natural daylight, and low-consumption LED lighting.